It's hard to beat a good peach. I consider them the non tropical mango. I'm growing Long Beach Peach which is also an early variety. I'm interested to see which variety will ripen earlier. My Long Beach peaches should ripen in about three weeks. When does your Florida Prince usually ripen? We have been eating the peaches for a few days now. It should peak in a week or 2. This is a really good peach cultivar for southern CA. I am further south and futher inland than you though so ripening times sound pretty comparable to yours if they were both grown in the same locations. Peaches started disappearing so I put out the trail cam last night. Wow, that's another animal we need to deal with, luckily coyote can't climb trees! Now I know they eat fruits, too! That is definately an early peach. My Long Beach Peaches should be ready in I'm guessing two weeks. This tree is in full bloom. Nothing else is blooming yet. Tropic snow looks like it will blooms next. I adore peaches but at least here in TN you have to spray them constantly to get a crop. CA is a big place but here no, I don't spray at all. 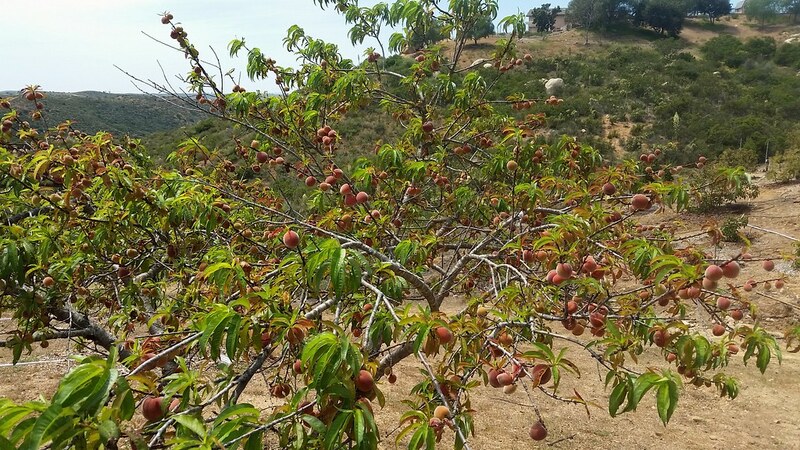 This tree takes almost no effort and makes hundreds of peaches every year. Wow that's awesome!!!!!!!! Enjoy that, man. My friend has planted a couple hundred peach trees as a commercial orchard and has so much spraying equipment and supplies, it's crazy. Approximately how many years old is that tree? Looks great! Its around 10 years old. Not exactly sure since it was here when I moved in. Was very neglected and had not been trained or shaped properly and was being eaten by deer. Thats all fixed now and it does great. the peach will sell to markets? or only for ownself?